Just as much as it’s not summer without pool days, it’s not summer without a good pasta salad. Usually the things are laden with heavy dairy products, but not this one! It’s completely dairy-free and loaded with the perfect combo of crispy veg. Pasta heaven in a bowl. Plus, it comes with a VIDEO! If you enjoyed this video, be sure to check out my first one for Vegan Chai Ice Cream. I’m getting really into the video/editing process and having a blast doing it. So stay tuned for more in the near future! It’s simple, requiring just 30 minutes start to finish and just over 10 ingredients (depending on what spices you go with). The result is a light, fresh pasta salad with a tofu-based dressing that no one would ever guess was dairy-free. And the veggies? Perfectly crisp and uber colorful. 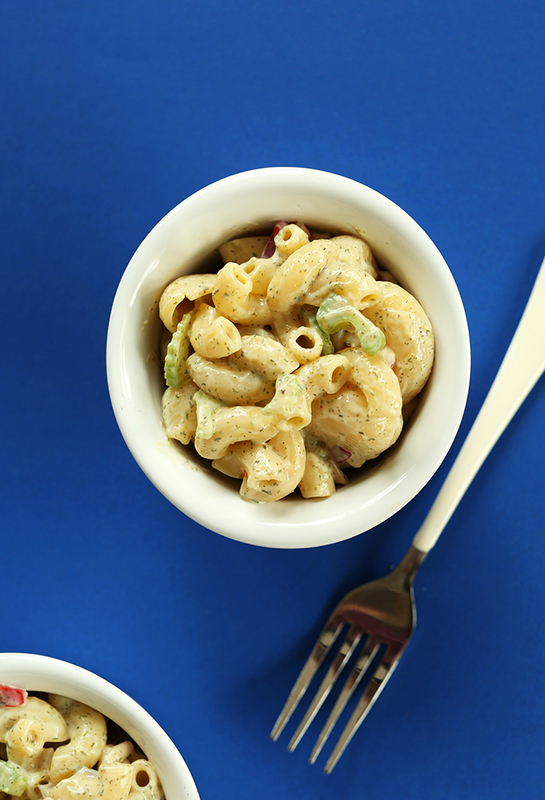 Classic macaroni salad made vegan – ’nuff said. Where might you take this pasta salad? A barbecue, a summer shindig, a lake day, a picnic, in yo lunch, camping… You get the idea. Make this salad and take it with you everywhere this summer. Cheers! 30-minute vegan pasta salad loaded with colorful veg and tossed in a dairy-free, undetectably tofu-based dressing. Perfect for summer shindigs, cookouts, and picnics. Prepare dressing by adding silken tofu, dill, salt, pepper, garlic powder, agave nectar (or sugar), vinegar, oil, and spicy mustard to a blender and blending until well combined. Scrape down sides as needed. If having trouble blending add water in Tablespoon amounts until it has enough liquid to churn properly. Taste and adjust seasonings as needed. I added more dill, mustard, salt and agave. Toss drained noodles and veggies with the dressing in a large serving bowl. Chill for at least 1-2 hours before serving. The flavors will meld and the salad will thicken up the longer it chills. Serves 8 (as original recipe is written). Store leftovers in the fridge for up to a few days. * You can sub 4-5 Tbsp fresh dill in place of 2-3 Tbsp dried. This was a solid base, but it really didn’t come together until we added a few tbs of sweet relish, 1 tsp of dried parsley, 1/4 c soy free vegenaise, and 1/4 tsp paprika. NOW it’s phenomenal and I love that there’s protein! Greetings! I love this recipe, however what are other substitutes instead of cashews & mayo? I am trying to stay away from tofu for a bit. This recipe looks great! I’m planning on using cashews rather than tofu as you suggested as an alternative. Thoughts on how many cashews? Thanks! I have made this several times now. Just love it! I cut down on the agave because it was a little sweet for me and I also added more veggies (shredded carrot and radish and added various colored peppers) and plenty of Dijon mustard. I can’t recommend it enough. A definitely must try recipe! Wow just made it and turned out perfect ! Used maple syrup instead, added about 1 tbsp of vinegar and more salt and pepper ! Absolutely delicious! What a great and easy recipe! It’s a part of a my weekly meal prep now. It looks delicious! Just made it and it’s chilling in the fridge! The dressing was on the sweeter side for me though. Is that how it is supposed to be? Thank you for all the yummy recipes!!! Five stars!! Instead of elbo macaroni I used veggie rotini and it is by far my favorite pasta salad even from before going Vegan. So glad I found this recipe. Thank you so much!! I added 2 cans of beans (1 kidney, 1 cannellini) and brought it to a going-away party so I would have something to eat. The silken tofu dressing is very good! I usually don’t care for tofu dressings, but on this macaroni salad there was no detectable tofu-ness. I did find it a bit sweet and will probably cut back on the agave next time, but I realize that is just personal preference. Overall it’s an excellent recipe, and I’ll be sharing a link to it in my newsletter going out today. Thanks! Happy throw back Thursday to you Dana! Time to get out the parachute pants LOL(sorry I live in the 80s!)! I’m making this today and I’ll let you know how it turns out but I’m sure it will be just perfect! I am planning to make this for a camping trip this weekend but so far unable to find silken tofu anywhere. Any other recommendations? Girl, you can cook!! Another delicious dish. It was creamy, full of flavor with a hint of sweetness. I added some fresh garlic for extra flavor. When I can get 2 thumbs up from my chicken-eating-hubby I know it’s really good. I only wish I could give this more stars. I made this with just a few personal taste tweeks (more garlic powder, onion powder, and yellow mustard because that was in EVERY pasta salad I had growing up.) this pasta salad will be my new go to, especially since going off animal products. After its chilled you can’t even tell its a tofu base! Love, love, love! I finally understand what silken tofu is for, lol! Can you make the dressing with cashews instead of tofu? Thanks! 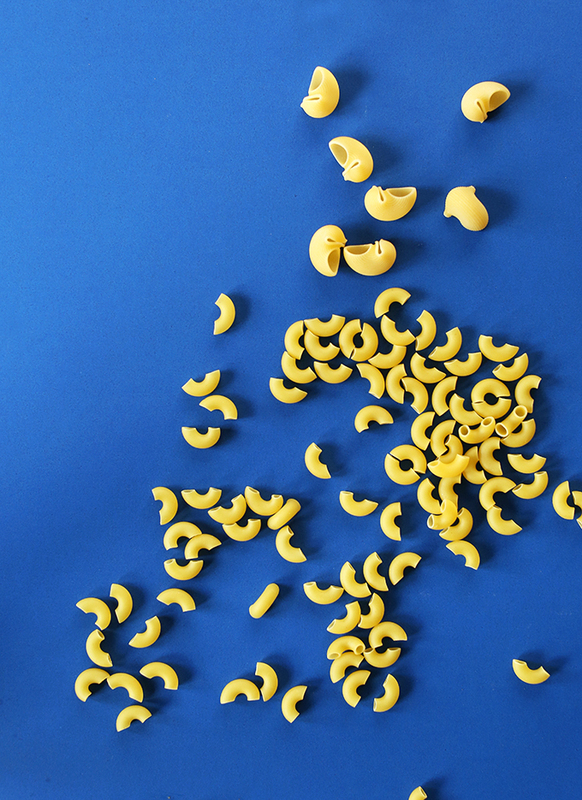 Yes, soaked cashews will work! I made this recipe this weekend. I followed it pretty closely–using the low end of the ranges for sweetener and dill (dried). I didn’t have a lot of celery, but made up for it with frozen peas. It turned out well, though I wasn’t a fan of the sweet and dill together in the dressing. I want to try a dressing with silken tofu again though. I do make a lot of your recipes and really enjoy them! My sauce tasted like straight up tofu. Maybe the sweetener fixes that, but I don’t like sweet pasta salad, and maybe chilling fixes it, but I didn’t want to find out if it didn’t work, SO. I added a bit more vinegar, salt, and pepper, and then started to panic at how tofu-y it still was, added homemade vegan mayo by the heaps, and then completely lost my mind, and threw in some soaked cashews I had in the freezer, and that fixed it. Mighty tasty, it will be scrumptious when it’s chilled overnight, but four stars because I’m bitter about thinking I might have had to throw it out ? For future reference, does chilling it make the tofu taste die down? I made this for a work potluck and it was so easy to make. I forgot to add oil but it was still delicious as hell ? Am I the only one who noticed that there were red onions in the photos but not the recipe? I did not read all 8,452 comments but it seems to me that the author would have fixed the recipe by now if people had noticed, and said something. Especially since the red onions totally make the recipe! Not a criticism, since I love the recipe and will definitely make it again. Just sayin’ that all the commenters who didnt notice the lack of red onions are totally missing out on the true beauty of this wonderful dish. Is there anything I could use instead of tofu or mayo? I’m obsessed with this macaroni salad! I’ve made it twice this week already. I make a few small changes: I cut down the agave and the olive oil to one tablespoon and add about a tablespoon more vinegar. It’s the best macaroni salad I’ve ever had, vegan or not. Thank you for sharing it with us! I subbed Just Mayo instead of tofu (about a half a cup, plus a few tablespoons of water to thin it out) and used my trusty immersion blender to make the sauce. I added chickpeas to the salad for some protein…and with broccoli, red onion and cucumber as the only veggies in the house, this turned out perfect. Thank you Dana for inspiring so many of my meals! I made this for a BBQ where my boyfriend was the only vegan. Everyone loved it and couldn’t understand how it was so creamy! Totally yummy. Your blog is a life saver for me as although I’m a veggie it can be difficult for me sometimes to think of vegan alternatives. I added a bit more garlic powder and some chili flakes for a bit of a mild kick and let it sit over night before serving. It was really quite great and tastes quite rich! Everyone loves the creamy dill flavor. 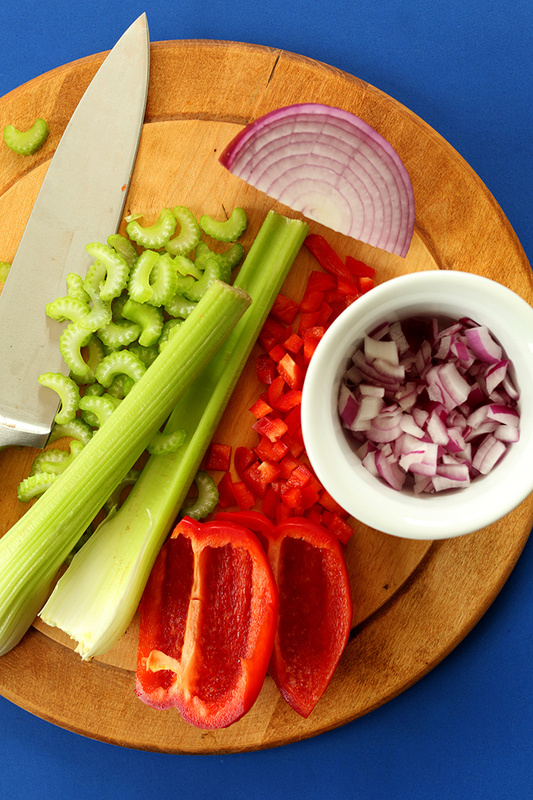 Use 1/2 as much sugar (cane) and more salt, pepper, and vinegar. Made this today and it was so good! Tastes exactly like a mayo pasta salad, but better! Wish I had dill, but just used a few different dried spices to give it taste (basil, celery seed, thyme). This was so easy to make and was a huge hit. The serving size is a lot though. Perfect for a picnic! Will be making this again. I just made this and it is delicious! I added extra red bell pepper, celery, and red onion. I also added shredded carrot and halved yellow grape tomatoes. I can’t find silken tofu at my local grocery stores so I used firm tofu and used a food processor instead of a blender. I do this for other recipes calling for silken tofu and it always works out perfectly. Just make sure to process thoroughly so it’s nice and smooth. My favorite pasta salad! I did it at least 5 times. Usually i am a big fan of mayo and this one is amazing with tofu! Where are places to purchase silken tofu. I resolved to making this recipe with veganaise after multiple store stops and no silken tofu. Try using regular firm tofu and using a food processor instead of a blender. Make sure to process thoroughly. I can’t get silken tofu in my local stores either and this is what I do. It works great. I just made potato salad using the dressing portion of this recipe. I’m not one to usually keep tofu on hand, so I subbed canned white beans instead. I found that I needed to add a few Tbs extra water and oil to get a nice, creamy consistency. This turned out BOMB! So delicious. I really enjoyed this recipe, especially with the dill! I did double the veggies, and I think it would be good with other veggies as well. I also increased the pepper and mustard to give it a bit more spice. BEST DRESSING EVER! The silken tofu dressing is amazing – and a great, versatile base to use for a variety of creamy-based salad dressings (potato, slaw, veggie dip, etc.) Play with the “add ins” and have fun creating some wonderfully flavored concoctions. I have made it several times – and now double the recipe so that I can have a jar of reserve in the fridge. AND – gluten-free, dairy-free, vegan, or not – this is a great dressing to use in the summer when one is leery of using any ingredients that are especially susceptible to spoilage when sitting out at a picnic in hot weather. My one suggestion: Cut back at least half on the agave/honey/sugar used to begin with. Make and taste and then add more sweetener to your taste or recipe needs. This was outstanding. Thank you for the recipe. This was fantastic!!! I know some people in the comments were feeling that 4 cups of dried pasta might be too much, but I ended up using around that much (around 450 grams of macaroni, which was probably about 3.75 cups or thereabouts) and it was perfectly fine. I think I’ll probably lower the pasta amount and add in more vegetables next time (carrots maybe? or green beans? or broccoli? diced pickles? ), but it was delicious the way it was. The only thing I’d do differently about the dressing is probably add less sugar–I used the minimum recommended amount, and it was still a little bit too sweet for me. Overall though, this is a really easy and really delicious recipe, and I’m sure I’ll be using it several times this summer! I have a friend allergic to soy, what could I use instead (no dairy, either)? This recipe turned out great! i substituted mint and thyme for dill (thats what I had in the house) and it was delicious! Hands down best vegan pasta salad recipe. Even my non-vegan sister loved it and she’s a picky eater! So great! Thanks for sharing, Janice! Four cups of macaroni. That must be cooked? I would think the salad would be very dry using that much dry pasta?!? Looks great! Want to make right now and have no tofu. Any idea for a substitute? I Made it yesterday and my boyfriend made it dissapear in seconds (with chicken on side). He does not eat dill and soya…well did not eat untill now. Had no idea poor thing. I have just discovered your blog when searching some silken soya recipes and love it! Wow! Sounds delicious! I really want to make some for my family, since They think I only eat vegetables ? what do you mean by spicy mustard? Dijon mustard? Thanks! ? Do yo u think this could be frozen? Made the recipe and loved it but have a ton left over and don’t want to waste any. I used extra vegetables in place of some of the macaroni, rice vinegar, 3 tablespoons maple syrup but would recommend half that, 1 1/2 tablespoons Dijon mustard, and no oil. I suggest starting with half the sweetener and adjusting, adding extra mustard, and patting the tofu dry before blending for a creamier dressing (no water needed in my case). I was unsure about the tofu-based dressing at first, but it’s healthier than mayo so I gave it a try and LOVE it. Please share with us more tofu-based dressings! 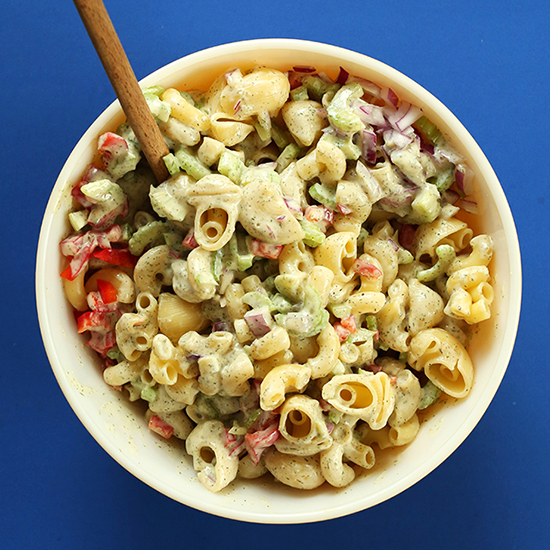 Great starting point for macaroni salad, which is versatile to begin with. I will try radishes and olives as others have suggested next time. this is really good!!! thank you for posting!!!! ive made it twice now and my boyfriend loves!!!!! Any ideas for making this dressing without using a soy product? I need it to be vegan but also soy free. Hmm, what about soaked cashews? I made this for a picnic and it is so incredibly good. I am vegan, but I also am serving it to my non-vegan friends. The dressing is simple to make, but the taste is tangy and complex. As for the pasta amount, 16 ounces worked great. That is about 4 cups uncooked. I used two different interesting shapes, which makes the dish look fancy. I also added a cubed avocado (not too ripe or it will fall apart) and garbanzo beans. To thin the dressing, I used a almond/coconut milk blend instead of the water. I made this today–It is a really great recipe. I used quinoa elbow pasta and made the following changes: added peas, 4 oz cubed “Jjlapeno jack” almond cheese, and 4 slices soy bacon (chopped). I didn’t have white wine vinegar so substituted apple cider vinegar. Finally, I added a few large spoonfuls of Vegenaise and 3T dijon mustard to make it extra creamy. Thank you for the recipe! Just made this today! It’s wonderful! I used 2 garlic cloves instead of powder and yellow mustard instead of spicy mustard. Can’t wait to experiment with the recipe again! Wonderful! So glad you liked it, Allie! I know this is an older post but checking to see if i could just leave the oil out of this recipe? How important is the oil? Was this supposed to be 4 cups of cooked macaroni?! I cooked 4 cups of dry, thought it looked like too much and left a bunch out, but it still became dry after it was refrigerated. The taste was good, but I added juice from dill pickles to take away the dryness. Hmm, it’s been so long since I made this that I still feel like it’s 4 cups dry. It’s even what I say in the video, but it does look like less. Perhaps I meant 4 cups cooked? Sorry to confuse! I’ll retest it as soon as I can. Otherwise, just cook as much as you’d like in order to get the right sauce:pasta ratio. Thanks for asking! Did you ever determine the dry measure of noodles for this recipe? I used 4c cooked macaroni and that worked out just right. The recipe says serving size 1/2 cup and serves 8 so I think it was meant to be 4c cooked macaroni. Any suggestions for a non-soy sauce that would be good for mac salad. I tried to be vegan for a while and found out I’m terribly intolerant of soy :( A cashew-based sauce? Ooh. I want to try these! I am eating this now! It’s amazing. I have never used tofu to make a dressing and it was creamy and perfect! I LOVE IT!!! The bit of sweatness is a huge plus and complements the onion in a big way! I just finished making this- it’s FANTASTIC! Definitely need to adjust seasoning to taste..I only added half the sweetness (cane sugar) and I actually wish I’d added less. Not too into sweet mac salad..but by adding a bit more vinegar, mustard and fresh dill, I countered that. The tofu is amazingly creamy..salad is chilling now and I’m sure will be even better by dinner time. Thank you! This is AMAZING. I used sunrise firm tofu because I didn’t have Silken and it blended perfectly. I cut the mustard in half and added a few pinches of cayenne pepper since I was using regular mustard (not spicy). I also added extra dill. It turned out so yummy. Thanks! This has got to be the best thing ever. I think my boyfriend and I ate this for 2 weeks straight. I wasn’t sure if I had found the right silken tofu, so I substituted with Hampton Creek Vegan Mayo. BOMB! How much mayo did you use, if you don’t mind me asking? I’m in the same boat as you right now, we have extra firm tofu instead of silken firm and I’m in need of a replacement. I used one cup of the mayo, and inside of blending, I mixed the dill, salt, pepper garlic powder, agave nectar (or sugar), vinegar, grape seed oil, and spicy mustard all in a bowl before mixing in the macaroni. Thank you! We tried a cup with the vegenese and it came out wonderful! Hey instead of tofu can we use cottage cheese/ curd ? I am intolerant to anything with vinegar, so what would you suggest to replace the white vinegar and the mustard (usually vinegar in it also)? I’m still having a hard time to find something to put on my burgers that would replace – relish, mustard, ketchup, BBQ sauce. Thank you for helping me! Lemon Juice. There’s also mustard powder that I use because I can’t stand vinegar either. When a recipe calls for vinegar, I always sub in lemon juice instead. For mustard for sandwiches, try mixing mustard powder and a little lemon juice. Add a little sweetener or other things until it comes out to your liking. You could try the same thing, to make ketchup, but start with tomato paste, a little lemon juice, a little maple syrup. and some spices, like onion powder,, etc. For relish, maybe chopped cucumbers, in a solution off lemon juice and agave syrup, with onion powder and mustard seeds. Since most of these suggestions use lemon juice as a substitute, you could try making all 3 with the lemon juice as the base ingredient. My sister works with Neal Barnard and I needed a pasta salad to take to a party but I told her I didn’t think I should make a vegan salad. She said whenever she brings something (vegan) to a party it always goes first. So I found this, just made it and is it delicious!! Wow!! Since there was fresh white corn at the store, I added that. Lovely! So glad you enjoyed it, Louise! Hi! I am searching desperately to find opaque colored backgrounds that are exactly like the one you’ve used above for food pics! Can you please tell me what resources you’ve used for this background? Do I have to buy professional tools or can I find things like this at Target or something, or just use cool fabrics that are laying around? I’ve tried little colored science boards and have painted some white boards but it just doesn’t look that great, or professional. Maybe this is something discussed in the online food photography class?! I do discuss this in the online food photography course! Also, we have a new food photography product coming out very soon, so stay tuned! I love your website – thank you for all of your great, simple, healthy, plant based dishes. Ah! Looks delish! I am going to try to make this right now— but I don’t have any silken tofu on hand! Do you think that I could substitute the tofu with an avocado? That should work! It will taste a little different but still delicious! I just made this and WOW is it good! I’m going to have to make this again for a pool party I’m going to saturday! Yay! Glad you enjoyed it, Hayley! Btw, I am obsessed with this video! Great job! This was so delicious!! So fast and easy to make too. Best part, my non-vegan husband loved it; even after I told him it had tofu in it! Thank you for an amazing recipe! This looks and sounds SO fantastic! I love finding any excuse to use Vegenaise. Oooh! this was great…a perfect no-oven summer dish! I used shells instead of elbows, and tossed in some diced cucumber and radishes…will definitely be making this again! The video is very cute…johnny cash AND vegan pasta salad…win!!! [ Smiles ] Great! A delicious vegan recipe that anyone can make! Oh wow! That tofu blended up so smoothly, I had no idea you could do that. I can’t wait to try this method for other tasties. We added more dill, some black olives, and omitted the sugar. This is one of the best pasta salads ever – thank you so much for sharing! STOP, this is too perfect. Love pasta salad, love your images (and fonts!) and love the video! And your (vintage Pyrex?!) mixing bowl! And of course, can’t say enough how much I love all the vegan stuff. I must make this! Do you think I’d enjoy the dressing if I’m not a mustard fan? I hate it straight, but am usually ok with it as an ingredient in something like a dairy-free “mac n cheese” sauce or something. Thanks Katherine! I found the mustard to just add a little tang, and you really can’t taste it that much. But try it without first and then add it in if you’re concerned. Hope that helps! How does the tofu-based approach compare to using a vegan mayo? very similar, actually. Only you wouldn’t need to add any sweetener if using mayo because it’s already kind of sweet in my experience. Hope that helps! Yum. Love a great pasta salad in the summer. Thanks! What an awesome creamy dressing! I can imagine how delicious it would be with all of the herbs and mustard. I’ll definitely be trying this soon! P.S your photos are always, consistently, awesome. This blog is a pleasure to read! Holy cow! This looks so, so good! 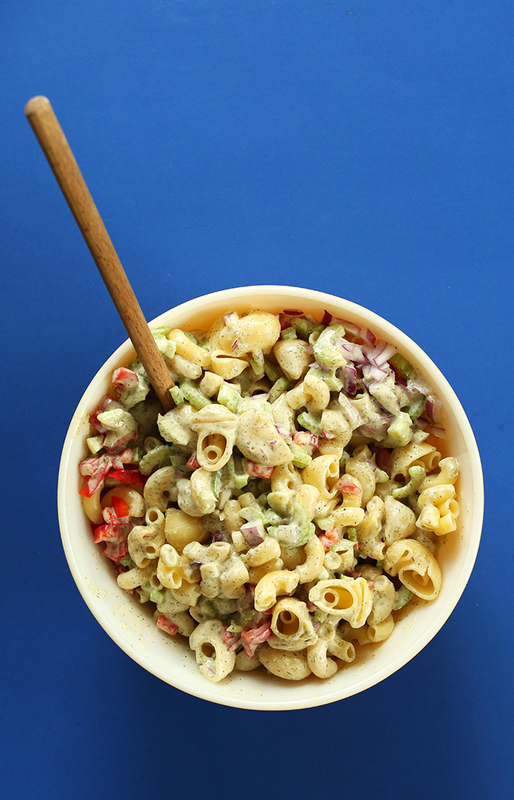 Nothing says summer to me more like a giant bowl of creamy macaroni salad- it’s the best! Will be making this one soon! Such a fab video (and the recipe, obviously!) – the editing is seriously amazing and love a bit of Johnny Cash! These sounds lovely! I’ve bookmarked it to make at some point! Love your video!! Editing is spot on :) recipe looks super yummy! Yay! Hope you and your dinner guests enjoy it. And thanks for the kind words on the video! I’m starting to love the process of videoing/editing! Love the video (especially the music!). It was definitely very you, even though the format wasn’t just words and pictures :) ‘Boil them noodles’ made me laugh! Love the blue background and basically everything about this post! I love the idea of using tofu as a base for this sauce! I tend to not make pasta salad because I don’t like mayo-laden things. I’m excited to try this out! Thanks Jenna! Let me know if you give it a go! And no mayo either! Looks great- exactly what I want in a pasta salad. Thanks!! No mayo for days and STILL amazing!